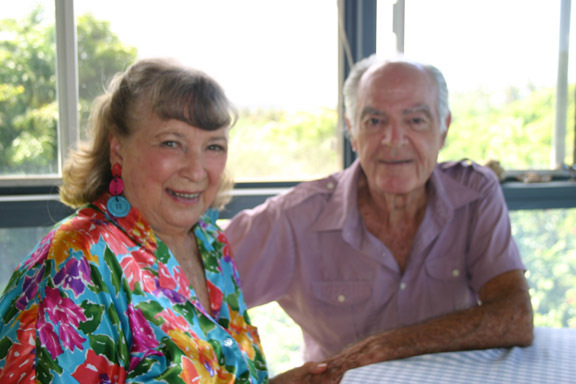 Mary Ellen and her husband Clyde. As you can see, he's much more good natured than Poopdeck. No bite marks! Mary Ellen maintained friendships at Channel 13 with Bob Olson, John Haberlan, Roy Leep, and others. She watched 13 as her main source for local news, sports, and weather, but never returned to do another show. "Sure, I missed being on TV. But there weren't any shows like mine on at the time. That's still true today." I asked Mary Ellen to compare her show to any of today's programming for young viewers, and her comment was very interesting. "Today's shows are made for a very specific age. If you're five, you watch 'Sesame Street'. If you're ten, you watch 'Pokemon.' On my show, we'd have all these different age groups on the program, so it wasn't just for the five year old or seven year old. My program ran from age one to age twelve." Of course, I had to ask Mary Ellen if there were any incidents with the kids or props that stand out in her memory. "Reddy Whip aerosol whip cream had just become available and I had never used it, and didn't know how forceful it would come out of the can. So I'm doing a live commercial with the kids all around me, and I'm saying how good it tastes…this little boy next to me says 'What does it taste like?' I said 'you want to find out?' He says 'Yes.' So I squirted it into his mouth...and the Reddy Whip came out like gangbusters! And it filled his whole mouth! His eyes got as big as dollars as this stuff is starting to leak out of his mouth. And I thought, 'I've killed a kid on TV!' There was complete silence. All of sudden, he smacks his lips and I knew he was alive. I said 'How is it?' He said 'Good.' Oh, boy, I'll tell you that was a scary moment." Another time, 'Poopdeck' lived up to his name. "I was getting ready to draw a Funny Face for a child and Poopdeck's sitting on top of the drawing pad like he usually did. Suddenly, he turned his back to the camera and pooped right down on the page. I ripped it off and started all over again." How about another Poopdeck story? "One time when we were home, this lady came in from the street and asked if there was a baby in trouble. She heard a baby crying in the back of our home. Here it was Poopdeck imitating the new baby next door." So what happened to Poopdeck after The Mary Ellen Show ended? "We returned him to his owner at the pet store. Poopdeck was then sold to Sunken Gardens. They had him on display...and one day...somebody stole Poopdeck! He was kidnapped and we've never seen him again!" The importance of Mary Ellen to her young viewers was underscored in this bittersweet tale. "After I was off the air, I was checking out in a store and the cashier said, 'Mary Ellen, I know a little girl who is very sick, and she's always wanted a 'Funny Face.' Would you kindly make me one and I'll give it to her?' I said 'sure,' and I went home and made one and took it back to the store. The next time I saw that cashier I said 'Did she like the Funny Face?' The cashier told me 'She loved it…but now, unfortunately, she's gone.' And you know what, they buried the little girl with her Funny Face, because it meant so much to her." Mary Ellen and Clyde moved to Princeville, Hawaii (on the garden island of Kauai) in 1980. Mary Ellen's performing talents were showcased in productions for the community theater. She was a cherished member of a local church and sang in the choir. On new year's day, 2005, Mary Ellen and C.L. celebrated their 50th wedding anniversary. I asked Mary Ellen if she had a final word for the readers of our web site. "Those were some of the happiest days of my life, because I love working with children. You never know what they're going to say or do…they are just so spontaneous. They are just so natural. It was just wonderful and a great life." Before we ended our conversation, Mary Ellen told me that she'd seen a local kids' show that had a couple of puppets exchanging banter back and forth. She wondered if they'd like to have somebody come in and draw 'funny faces.' Hmmmm. 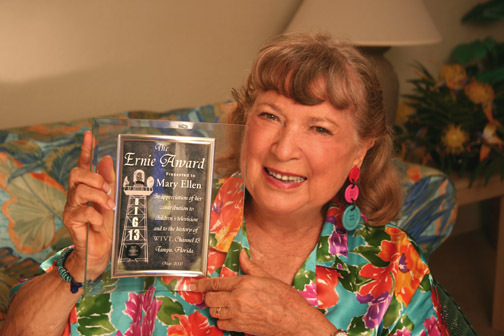 Mary Ellen was honored in 2003 with an "Ernie." The Ernie is an appreciation for extraordinary service to WTVT. The picture below shows Mary Ellen and her Ernie in 2004. Mary Ellen shared a very nice story. Remember that she lives far, far away from Tampa? Well, Mary Ellen was at her local Princeville store and spotted a man with a cockatoo (a bird like the one who sat on Robert Blake's shoulder in "Baretta"). After admiring the bird for a moment, Mary Ellen mentioned that she once had a parrot named Poopdeck. The man looked blankly at her for a moment and said ".....are you Mary Ellen?" Thousands of miles from Tampa and forty years later, and another fan remembers the wonderful Mary Ellen. Mary Ellen's beloved husband C.L. died on May 18, 2007, after a long illness. They were married for 52 very happy years. Mary Ellen passed away at the age of 87 on April 7, 2011.